“Jammin’ with Jamie” Theme: “‘Pee-wee’s Big Holiday’ Anniversary Celebration (with Special Guest Elliott Serrano)”! On March 18, 2016, Pee-wee’s Big Holiday, starring Pee-wee Herman, debuted on Netflix. That makes this Saturday the film’s one-year anniversary! 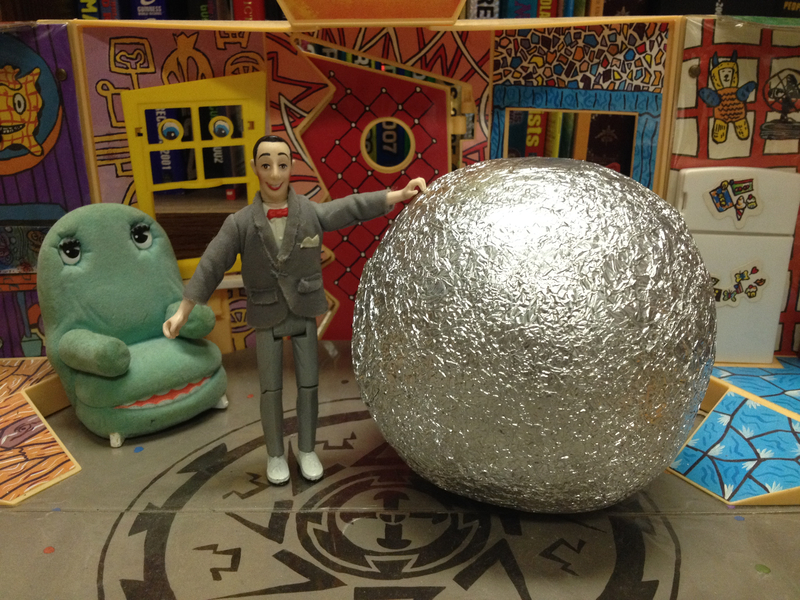 In honor of Pee-wee’s Big Holiday’s big anniversary, here’s a picture of my foil ball! It’s been growing since February 19, 2015, and now has 100 pieces of foil! Given how much I talked about the film before its release… years before its release… how big of a Pee-wee Herman fan I am in general (Exibit A! Exibit B! Exibit C! ), and the fact that Pee-wee’s Big Holiday’s anniversary falls on a Saturday, I just can’t pass up the opportunity to celebrate! This entry was posted in 89.3 WNUR FM, Jammin' with Jamie, Movies/Film, Music, Northwestern University, Pee-wee Herman, Radio, Television/TV, Theatre, Thoughts On and tagged Elliott Serrano, Judd Apatow, Netflix, Paul Reubens, Paul Rust, Pee-wee’s Big Adventure, Pee-wee’s Big Holiday, Pee-wee’s Playhouse, Pee-wee’s Playhouse Christmas Special on March 13, 2017 by Jamie Lee. Before we get started, follow Pee-wee Herman’s adventures on his official website, Twitter, Facebook, Instagram, and his new YouTube channel, and join his FREE Premium Diamond Platinum Fan Club! I’ve written about Pee-wee Herman twice before. Both times, I predicted I’d end up writing about Pee-wee’s Big Holiday when it was released on Netflix. 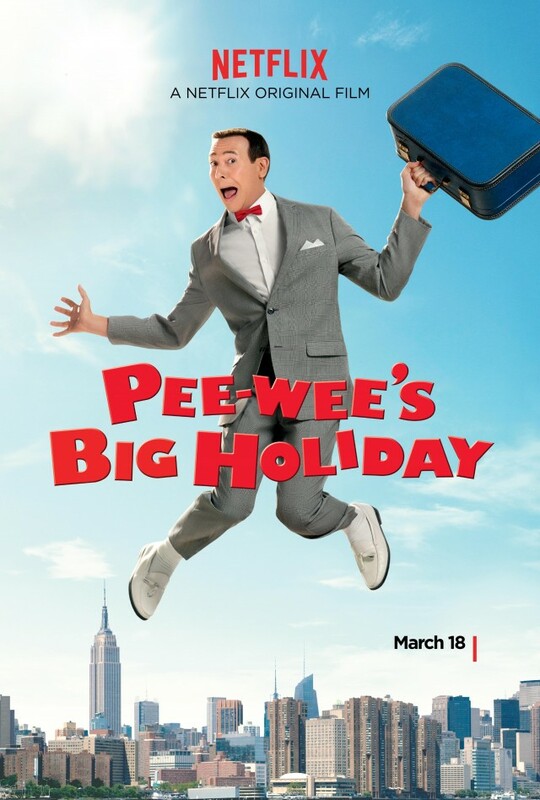 I was so excited for Pee-wee’s Big Holiday that I stayed up until 12:00 am PT––– 2:00 am my time––– to watch it the second it premiered! This was how I looked just before 2:00 am on March 18. Thank goodness I was on a different floor with the door closed… otherwise, my constant laughter would’ve woken everybody up! All of the following images, videos, and GIFs belong to their respective owners! This entry was posted in Movies/Film, Music, Pee-wee Herman, Television/TV, Theatre, Thoughts On and tagged John Lee, Judd Apatow, Netflix, Paul Rust, Pee-wee’s Big Holiday, Pee-wee’s Playhouse on March 24, 2016 by Jamie Lee.